Consider how the Son met His Mother on His way to Calvary. Jesus and Mary gazed at each other and their looks became as so many arrows to wound those hearts which loved each other so tenderly. How could Mother Mary ever forget this moment when she met her Son on His way to Calvary? As she stood before the Cross of her Son, she would have replayed this holy meeting over and over again in her mind and heart. As Jesus was carrying His Cross to Calvary, they lived this most tender moment as if they were one. After falling for the first time, He got up and continued His journey. Through all the pain and blood, He received the momentary consolation of a gaze of love from His mother. Their eyes met and their hearts united in sorrow and in joy. Sorrow filled their Sacred and Immaculate Hearts as they felt the deep pain of the other. Jesus, looking at His dear mother, was immediately aware of the sword that pierced her Immaculate Heart as she watched Him so cruelly treated. Our Blessed Mother looked at Jesus and saw not only the Savior of the World, she also saw her own child whom she loved with all her heart. Joy and sorrow co-mingled in their hearts as they each sensed and experienced the powerful emotions of their mother-child bond. Love was more powerful than suffering and salvation was more powerful than death. The interior joy they felt, knowing that Jesus was bringing forth the greatest grace the world had ever known, filled mother and Son in this moment and gave them both the strength they needed to bring this sacrifice to completion. Each one of us has the opportunity in life to ease the suffering of another by our tender care and gaze of love. When we encounter another in need, we have the opportunity to express our compassion. While pity looks down on another from a perspective of superiority, true compassion suffers with another with authentic empathy. True compassion shoulders another’s cross, enters into another’s mind and heart, and walks arm and arm with another down every rough road. Reflect, today, upon this beautiful but sorrowful scene of the gaze of love shared by mother and Son on the way to Calvary. Reflect also on the fact that both mother and Son meet you on your own journey toward the Cross. No matter what you encounter, no matter what you endure, they are there, attentive to you, loving you and offering their hearts to you. Seek also to emulate the hearts of Jesus and our Blessed Mother to those whom you encounter each day. Grow in compassion and concern for all who suffer, being present to them as they go step by step on their personal via dolorosa (sorrowful way). My Sorrowful Mother, you already endured so much. But you would not miss this short moment in which you could express your tender love for your Son. As you looked at Him, your heart intertwined with His. You felt the pain He felt. You communicated a supernatural joy that strengthened His resolve to give His life for the Salvation of the world. My dear Mother, pray for me that I may be open to your motherly concern for my life. As I carry my cross and endure the sufferings that befall me, intercede for me and open my soul to the strength of your Son as it flows through your own tender heart. My suffering Lord, as You continued on Your journey to Calvary after falling for the first time, You looked at Your mother with such love. 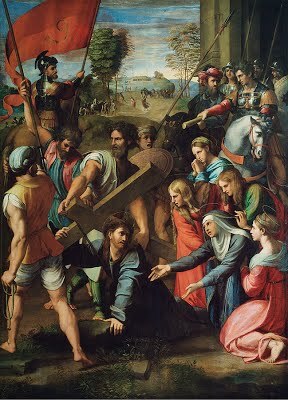 Your concern was not for Yourself, it was for Your mother and for all who would receive the grace of Your Cross. May I be one of those, dear Lord, who opens my heart to You at all times and who absorbs the graces You offer so that I can follow in Your footsteps. Mother of Mercy, pray for me. Jesus, I trust in You. Also Available in eBook & Paperback!